Earlier this month, community members from across the Mojave Desert came together at the Transitions Habitat Conservancy field station in Puma Canyon in the desert hills above Wrightwood, California, with a deceptively simple mission: to figure out how to count Joshua trees. The volunteer leaders — from the California Native Plants Society, the Mohave Desert Land Trust, and the Transitions Habitat Conservancy — spent the Veteran’s Day weekend at Puma Canyon to learn a protocol for demographic surveys of Joshua tree populations, guided by Willamette University Associate Professor of Biology Chris Smith and his collaborators on the Joshua Tree Genome Project, US Geological Survey ecologist Todd Esque and CSU Northridge Assistant Professor of Biology Jeremy Yoder. The Joshua Tree Genome Project and its partners are excited to announce a new community science program: Mapping Joshua Trees for Climate Change Resilience. Working with local conservation organizations and teams of community scientists, we will develop a comprehensive map of the current distribution of Joshua trees, and assess population health through on-the-ground demographic surveys. The results of this study will allow us to develop a conservation plan for Joshua trees in the face of climate change. We are currently seeking local leaders from communities across the Mojave Desert to assist us with the project, and will hold a series of training events beginning in November, 2018. To request more information, or become involved as a community scientist or a conservation leader click here and fill out the registration form. For more information, keep reading. We had a whole aisle to ourselves at the Henderson, Nevada, Super Wal-Mart. The shopping list for a month of desert fieldwork with a team of up to twenty filled half a dozen shopping carts — apples and oranges by the five-pound bag, piles of potatoes and pasta and oatmeal, twenty-five dozen eggs, three different kinds of Oreos, dishes and five-gallon water jugs and an extra folding table. We stacked it all in a rental RV, and the next morning we drove north. For years, JTGP collaborator Chris Smith has organized trips to Tikaboo Valley, a site at the northernmost end of the Mojave Desert where the two species of Joshua tree meet. Over the course of each flowering season, Chris leads a team of Willamette University students, field staff, out-of-town collaborators, and willing volunteers in an ongoing experiment to understand how the trees match two different, highly specialized, pollinator species. Tikaboo provides a natural “common garden” where it’s possible to swap the pollinator species between the two Joshua trees, to see how things work out for all of them. I drove up from Los Angeles to join Chris and his advance team in setting up camp in advance of the arrival of more than a dozen Willamette students for this week’s spring break. I was sorry to head back before things got properly underway, but I had a couple days to spend with the team scouting for flowering trees — a fine tour of Tikaboo Valley at the very beginning of spring. Click on the gallery below to scroll through some images of the trip! This post is by JTGP collaborator Jeremy Yoder, an Assistant Professor in the Department of Biology at California State University, Northridge, who studies ecological and evolutionary genetics. Since we first launched the Joshua Tree Genome Project, we’ve told you that one big reason we want to sequence a Joshua tree genome is to find genes that are important for adaptation to climate, which could help us makes sure that Joshua trees survive and thrive in a climate-changed future. But we haven’t discussed in detail how we’ll find those climate-adapted genes. The key to that part of the project is association genetics, a method for sifting through the genome to find the parts that contribute to traits we care about. To understand how association genetics works, first consider a case in which we already know of a gene that might be important for a particular Joshua tree trait, like height or flower shape or physiological performance — or even just growing in places that are hotter or cooler. To figure out whether different variants in the sequence of our “candidate gene” are related to differences in the trait, we could measure the trait in many trees and then sequence that gene in all of those trees. We would test the hypothesis that the gene shapes the trait by comparing the trait values of trees carrying different variants of the gene sequence. Figure 1 gives an example of what this might look like in a hypothetical case, with tree phenotypes plotted against diploid genotypes at our candidate gene — “homozygous” trees carrying two copies of the G variant have higher phenotype values than homozygous trees carrying two copies of the A variant, and “heterozygous” trees with one copy of each have intermediate phenotypes. In this case, we’d probably conclude that the candidate gene has some effect on the phenotype we decided to measure, because different variants of the gene are associated with significantly different phenotype values. This is a post by JTGP collaborator Karolina Heyduck, a postdoctoral researcher at the University of Georgia. Our Joshua tree proposal has been submitted to the National Science Foundation! Now we wait to hear if we’re granted to green light to study sources of adaptation in these remarkable desert species. So what does “adaptation” mean anyway? Adaptation refers to the process by which species over time acquire traits that allow them to succeed in a given habitat. A habitat includes both biotic elements – herbivores, pollinators, and pathogens – as well as abiotic phenomena like water availability, nutrients, light intensity, and temperature. Our research team is interested in both aspects. We suspect both pollinators and environment (temperature and water availability) are playing a role in Joshua tree speciation and adaptation, but we hope to test this with help from the NSF. Plant species that have become especially adapted to their environment didn’t arise in a single generation; instead, over many years, plants have passed down traits to their offspring that allowed these species to survive and thrive in tough conditions. However, when these abiotic environments change quickly – for example, due to climate change – plants may not be able to adapt fast enough, especially if they are long-lived with many years between generations. For Joshua tree, which can live over 100 years, adapting to their changing climate will be critical to their survival. Joshua trees are already showing signs of trouble (check out this National Geographic article on them), and the Mojave is only expected to become warmer, forcing Joshua trees to either adapt or die. 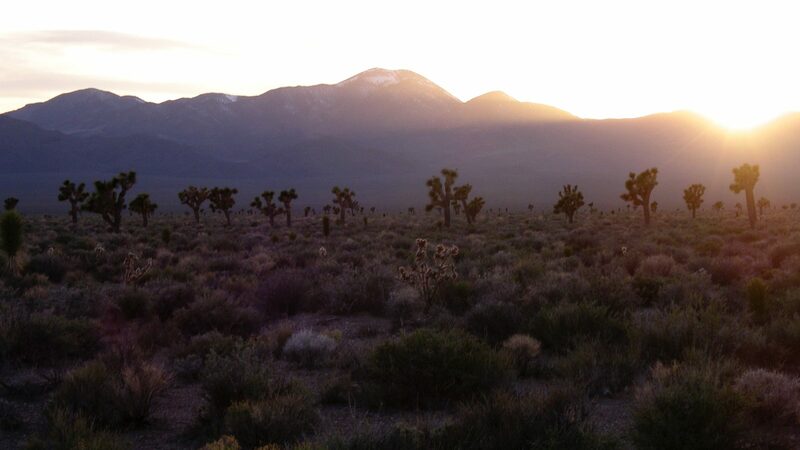 Currently Joshua trees are found across both high elevation (cooler) and lower elevation (warmer habitats). In both of those elevational levels, we also find Joshua trees in drier and wetter habitats. We might hypothesize that those Joshua trees already found in the hottest and driest habitats might survive best in the future, but we simply do not know. One big goal of our NSF grant will be to screen populations from different habitat types for traits that will help them succeed in the changing Mojave. But how do we do that? Our first step will be to collect seeds from different populations across both high/low elevations and with varying degrees of rainfall. We will grow these seedlings and plant them in gardens across the Mojave desert. Once they stabilize, we begin screening them for a long list of characteristics relating to water use efficiency and photosynthesis – two huge traits when it comes to desert survival. Water use efficiency refers to how much water a plant loses for every molecule of CO2 is gains. Plants take in CO2 through their open stomata, tiny pores on the surface of the leaf, but stomata also allow water vapor to escape from the leaves. This loss of water to the atmosphere is important for plants to pull water from the soil, forming a suction force like when you drink from a straw, but too much water loss in the desert can be deadly. Plants can minimize water loss by closing stomata, but this must be balanced by the need to take in atmospheric CO2 for sugar production. Photosynthesis is also important for plant survival, but can be impaired by extreme temperatures and a lack of water (Figure 1). Back in January we wrote to you about preparing a proposal for the National Science Foundation. Now, we have some encouraging news to share. Don’t break out the champagne yet though. Last month we received the good news that our proposal had been ‘invited for a full proposal’. As research funding has become more and more competitive, the National Science Foundation has turned to using ‘preliminary proposal’ system. Each January scientists from around the country put together short summaries of their latest and greatest research ideas. From the hundreds of preliminary proposals they receive, about eight dozen (approximately 25%) will be invited to submit a full proposal. We probably won’t hear a final funding decision until December at the earliest, and statistically, our chances are slim. But, at the moment, our thoughts are occupied with all the things that we will do if we were funded. It’s a long and ambitious list. We hope that it’s enough to make our work stand out. Wish us luck! It was a rainy winter in the Mojave, and it was mighty quiet around the ol’ Joshua Tree Genome Project Page. But we didn’t just huddle up around the fire. January means grant proposal deadlines at the National Science Foundation, so while the yucca moths were underground this winter, we were hard at work trying to find funding for the next phase of this project. The generous support we’ve received from donations at Experiment.com and from The Living Desert Zoo, we’ve made huge progress towards assembling the Joshua Tree Genome. However, completing the next stage in the project – identifying the genes involved in adaptation to climate change – is going to be expensive. So, we’re looking to NSF to help us make it happen. Thanks in large part to the work we’ve been able to do so far, that proposal we wrote back in January was interesting enough to NSF for us to be invited to the next round of consideration — look for an update on that part of the process soon. Research dollars are getting harder and harder to come by as federal spending for basic research has stagnated. So, the competition is fierce, and winning the funding game means we’ve gotta hit it out of the park. I hope what we’ve put together for tomorrow’s deadline is up to the task. The nature of discovery is that it is impossible to anticipate what you will find. That is discovery. Discovery-based research is most fruitful when new knowledge is sought for its own sake. If you agree, maybe phone a friend in Washington to tell her about it? The Joshua tree genome project is excited to announce a new partnership with The Living Desert Zoo and Gardens. Through a very generous gift from The Living Desert, we will use DoveTail Genomics Hi-Rise Technologies to assemble the Joshua Tree Genome. The genome is the complete set of DNA letters that spell out the ‘instructions’ for how to build an organism. By sequencing the genome of the Joshua tree we hope to be able to understand its evolutionary history, how it’s relationship with yucca moth pollinators originated and evolved over time, and how Joshua trees might adapt to ongoing global climate change. Ewww-eww! That Smell! Why do Joshua Trees Smell Like that? A little investigation reveals that the odor is coming from the flowers. The smell isn’t bad, exactly. Just odd. And strangely familiar. What does it remind you of? Wild mushrooms? Blue cheese? Windex? Overripe cantaloupe? A paper just published in the American Journal of Botany uses cutting-edge chemistry to unravel the mystery of why Joshua tree flowers smell the way they do. Glenn Svensson, a chemical ecologist at The University of Lund in Sweden, led an international team of scientists, including members Joshua Tree Genome Project, in collecting samples of Joshua tree scent. Using a hacked aquarium pump the team sucked up samples of air around Joshua tree flowers, and collected the odor molecules using some custom-made filters containing a special absorbent. The filters were then taken back to the lab, and analyzed using process called Gas Chromatography Mass Spectroscopy (or GCMS). Gas Chromatography separates the different odor molecules in a long heated column, so that different compounds are retained the column for different lengths of time. Mass spectroscopy ionizes each molecule and produces a “fingerprint” or “mass spectrum” based on its mass and charge. The combination of retention time and mass spectrum data can be used to identify the different molecules contained in the odor mixture. When Svennson and his team looked at the data from the Joshua trees, they found that up to 80% of the molecules found in Joshua tree’s scent was a complex 8-carbon compound called mushroom alcohol. The technical, less beautiful, name is (R)-1-Octen-3-ol, or pentyl vinyl carbinol. So why would a Joshua tree want to smell like a mushroom? The most likely explanation is that odor attracts the yucca moths that pollinate Joshua trees. Many flowers use odor as a way to attract pollinators, and it seems likely that the peculiar odor of the Joshua tree is somehow related to their peculiar pollination biology. Svensson and his team compared the odor profiles of different species of Joshua trees that are pollinated by different species of moths, and found that they are indeed significantly different from one another. Joshua trees from the eastern Mojave produce less mushroom alcohol and more of another chemical, poetically called (E)-4,8-dimethyl-1,3,7-nonatriene, which is also found in cardamom. The differences in scent does suggest that odor is important for attracting pollinators but, counter-intuitively, the two different species of yucca moth that pollinate Joshua trees seem to be unable to tell the difference between the different trees; where the two Joshua tree species grow together, the moths get confused and visit both trees equally. Why the flowers differ in their scent, even though the moths can’t seem to tell the difference, remains an evolutionary mystery for the moment. As we’ve talked about before on this site, the genome is the complete set of DNA letters that spell out the ‘instructions’ for how to build an organism. By sequencing the genome of the Joshua tree we hope to be able to understand its evolutionary history, how it’s relationship with yucca moth pollinators originated and evolved over time, and how Joshua trees might adapt to ongoing global climate change. This summer we started the process of decoding the genome.